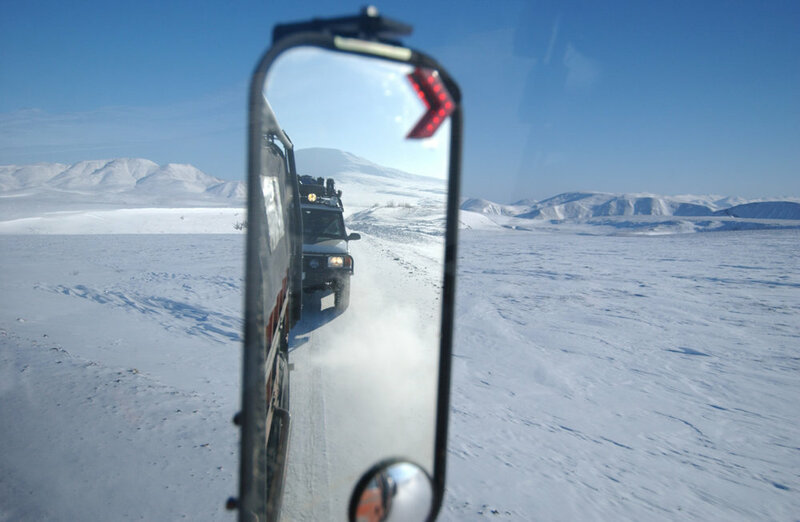 DRIVE THE GLOBE | Overland Adventures went to the Arctic Circle and beyond! On March 8, 2007 we departed from Edmonton Alberta Canada and headed North. The ultimate goal was the Arctic Circle via the Dempster Highway. The trek continued over winter ice roads and ultimately reached Tuktoyaktuk, a small village on the Beaufort Sea (part of the Arctic Ocean). Along the way the expedition travelled through the beautiful scenery of Northern British Columbia to Whitehorse, a small town in the Yukon Territory. It then continued through the gold rush town of Dawson City and then on to Inuvik. A large distance was covered in a fairly short period of time. All told, over 4800 miles were driven on this adventure of a lifetime.